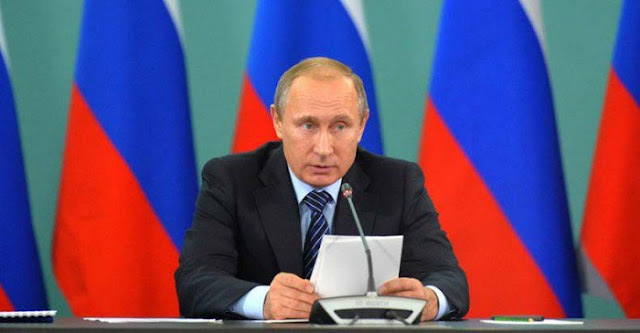 Antalya, Turkey – Russian President Vladimir Putin has announced that he has shared intelligence with the other G20 member states, which reveals the 40 countries from which ISIS finances the majority of their terrorist activities. The list reportedly included a number of G20 countries. “I provided examples based on our data on the financing of different Islamic State (IS, formerly ISIS/ISIL) units by private individuals. This money, as we have established, comes from 40 countries and, there are some of the G20 members among them,” Putin told reporters. 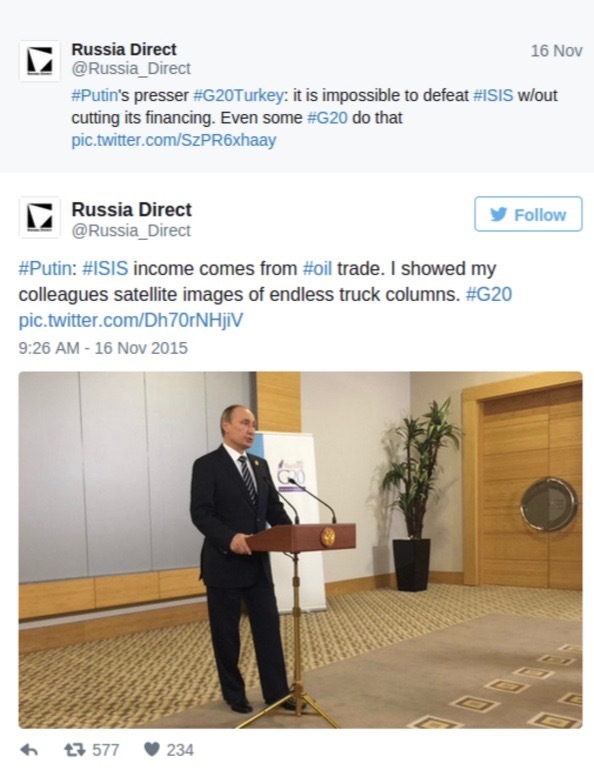 In addition to discussing the need to stop the flow of donor money to ISIS, Putin also reiterated the need to stop the illegal oil trade by ISIS. “I’ve shown our colleagues photos taken from space and from aircraft which clearly demonstrate the scale of the illegal trade in oil and petroleum products,” he said. “The motorcade of refueling vehicles stretched for dozens of kilometers, so that from a height of 4,000 to 5,000 meters they stretch beyond the horizon,” Putin said. The Islamic State makes an estimated $50 million a month from selling crude from captured oilfields in Iraq and Syria, according to Iraqi intelligence and U.S. officials. Oil sales — the extremists’ largest single source of continual income — are a key reason they have been able to maintain their rule over their self-declared “caliphate” stretching across large parts of Syria and Iraq. With the funds to rebuild infrastructure and provide the largesse that shore up its fighters’ loyalty, it has been able to withstand ground fighting against its opponents and more than a year of bombardment in the U.S.-led air campaign. It’s worth noting that within the past 24 hours the U.S. has launched its first strike against an ISIS oil convoy. Prior to Monday, the United States had refused to strike the over 1,000 ISIS controlled tanker trucks out of a stated concern about causing civilian casualties, a dubious assertion at best. Intensifying pressure on the Islamic State, United States warplanes for the first time attacked hundreds of trucks on Monday that the extremist group has been using to smuggle the crude oil it has been producing in Syria, American officials said. According to an initial assessment, 116 trucks were destroyed in the attack, which took place near Deir al-Zour, an area in eastern Syria that is controlled by the Islamic State. The airstrikes were carried out by four A-10 attack planes and two AC-130 gunships based in Turkey. While the U.S. claims these new operations were planned well in advance of the terrorist attacks in Paris, one can’t help but be suspicious of the timing of the U.S. change in tactics. 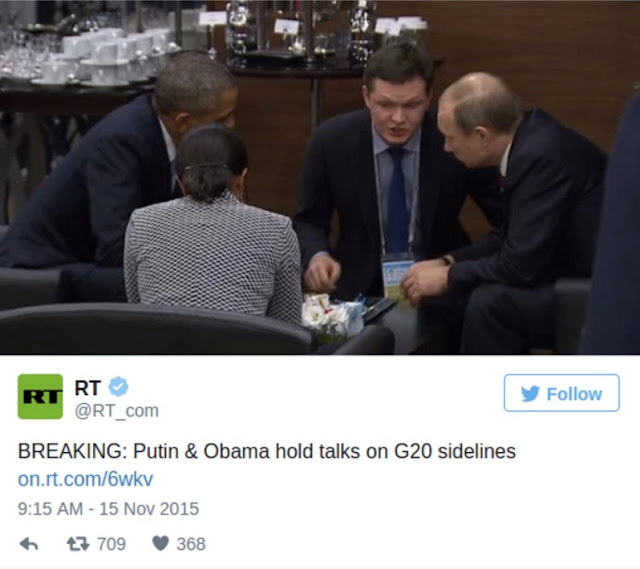 It seems that the U.S. is being forced closer to the Russian position in the wake of the attacks in France. During the press conference, Putin went on to stress that an international coalition is needed to more effectively counter the terrorist group, noting Russia’s readiness to support the fight against ISIS. “Some armed opposition groups consider it possible to begin active operations against IS with Russia’s support. And we are ready to provide such support from the air. If it happens it could become a good basis for the subsequent work on a political settlement,” Putin said. “We really need support from the US, European nations, Saudi Arabia, Turkey, Iran,” the Russian president added. In the wake of the claimed ISIS attacks in Paris, perhaps the NATO contingent involved in Syria will now realize that removing Assad is not the primary goal, and that fighting ISIS is the actual mission. The Russian intelligence analysis of the 40 nations funding the ISIS terror machine were relayed to diplomats attending the G20 summit – but were not released to the media, nor the general public. We will keep you updated if/when the names of the ISIS supporting states are leaked.